The Rockin' Axes at SFA will perform the music of Bruno Mars and Christina Perri as well as tunes by Dream Theater, Sade, Incubus, Stone Temple Pilots and Tori Amos when the ensemble performs at 7:30 p.m. Thursday, May 3, in Cole Concert Hall on the university campus. 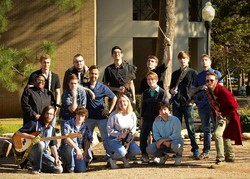 NACOGDOCHES, Texas - The Rockin' Axes at Stephen F. Austin State University will continue performing music of "The '90s and the New Millennium" when the student group performs at 7:30 p.m. Thursday, May 3, in Cole Concert Hall in the Wright Music Building on the SFA campus. Directed by Andrew Sperandeo, instructor in the School of Music's Sound Recording Technology program, the Rockin' Axes' study theme and program from last semester - "The '90s and the New Millennium" - continues into the spring. Since 2014, Sperandeo's students have examined the history of rock from the 1950s to the current decade. "As always, I try to mix up the set list with many subgenres within the category of rock/pop," said Sperandeo, who also teaches guitar. "I want to keep it interesting for students and expose them to styles they may not be too familiar with in order to improve their overall musicianship and, potentially, give them more opportunities in their future careers within the music industry." Among the selections to be performed is Bruno Mars' "Chunky." "It is the epitome of modern pop, and it's a fun groove tune most people can enjoy," Sperandeo said. The Rockin' Axes will perform "Hysteria" by the English rock band Muse. "Muse is a very talented, original hard rock band that all the students really enjoy listening to," Sperandeo said. The program will also include a performance of "A Thousand Years," which Sperandeo describes as "a beautifully written tune" by singer-songwriter Christina Perri. "As a professional musician, I have played this one in many settings since it was released several years ago," he said. "I chose to arrange this song for the group because it is one I still enjoy listening to all these years later." The Rockin' Axes will also perform a difficult tune by the American progressive metal band Dream Theater, as well as tunes by Sade, Incubus, Stone Temple Pilots and Tori Amos.